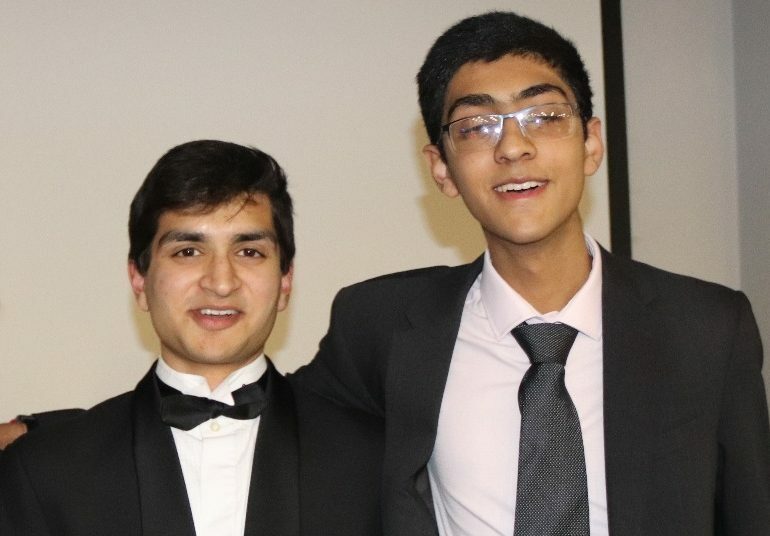 Two Sixth Form pupils secured well over £11,000 when they organised their first-ever major charity event – easily beating their £5,000 target. 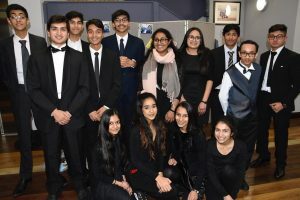 Year 13’s Parth Gosalia and Year 12 boy Rishi Shah put together a grand dinner, including entertainment, because both have roles as Youth Teachers at the Shri Chandana Vidyapeeth Jain School in Edgware and they were keen to demonstrate young people making a positive difference in society. The dinner, which took place at the Shishukunj Community Centre in Edgware, was held in aid of two charities: Debra, which supports people suffering from a skin condition called Epidermolysis Bullosa (EB), and Veerayathan Nepal, which is raising money for children orphaned by the large Nepal earthquake of 2015. Some 120 people attended the event, including committee members from the Jain School, charity representatives and local business people. Parth and Rishi worked with a third Youth Teacher, Shyam Shah, who is not a QE pupil. The final total – not including Gift Aid – came to £11,434, which was amassed through sales, a raffle and pledges. The entertainment at the dinner included a guitarist and a magician. 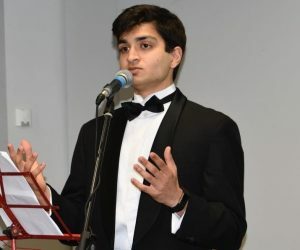 Parth, who has an offer to read Philosophy, Politics and Economics (PPE) at Christ Church, Oxford, and was a QE Vice-Captain last year, compered the event. “It was daunting at first and I was nervous to begin with, but in the end I really enjoyed the night,” he said. 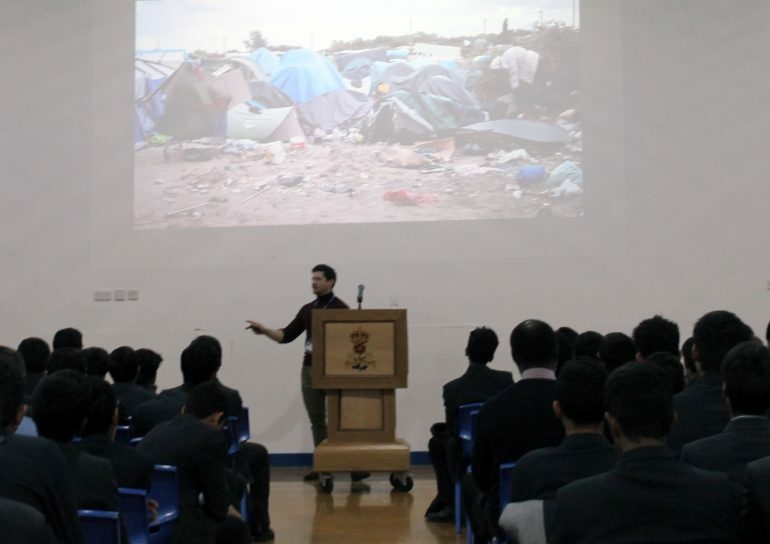 Rishi, who is a current Vice-Captain, delivered a 25-minute presentation on the charities’ work. Two years ago, he visited a school run by Veerayathan, which is an Indian NGO operating internationally. The dinner was, however, raising money specifically towards its work in Nepal, where the organisation is building a centre close to Kathmandu to house and educate children orphaned in the earthquake. It will also offer adult education courses. Jenny Jackson, Debra UK’s Business Development Manager, and Christo Kapourani, a sufferer from EB, both spoke at the dinner, and Mr Kapourani also announced the final total towards the end of the evening. Rishi hopes to go to Nepal this summer to work as a volunteer and to present the money raised. Another QE boy, Aaryan Sheth, of Year 11, also assisted on the day. A group of sixth-formers are working to set up a new charity in London after spending a day out on the streets helping the homeless. 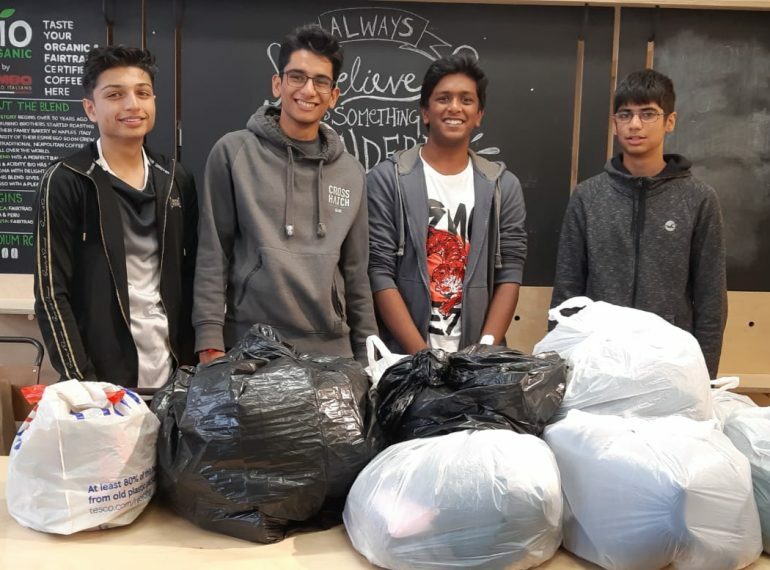 Kieran Dhrona, Humzah Hameed and Kabishan Sivarasan, along with a non-QE friend, planned the event in which around a dozen of their friends from QE and a further 25 from other schools, spent a Saturday handing out essential provisions to homeless people in the heart of the West End. The group, all in Year 12, gathered packs of water, non-perishable foods, clothes and toiletries from friends and families which they then distributed to those they encountered living on the street. On the day, 85 packs were given out and the volunteers engaged with more than 100 people. In certain cases, where additional needs were observed, they took other steps, such as bringing hot food. Throughout the day the boys had conversations with people living on the streets from Soho through Leicester Square and Embankment down to Southwark. They gently asked the homeless people they encountered how they came to be in their current position and made sure they were aware of the work of Centrepoint. Centrepoint is a leading homelessness charity which provided a room for the volunteers to use as a base for the day. Kieran, Humzah and Kabishan are working to set up a new charity called youthconnectionlondon which will focus on helping the homeless in the capital. “The more we grow, the more people we can help,” said Kieran. 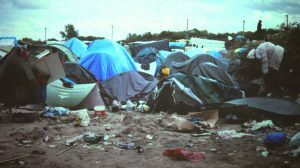 They are also exploring whether they can work further with Centrepoint, looking for a base from which they could prepare hot food. They are establishing a social media presence and working on a website to draw in further volunteers. “I wish them every success as they attempt to establish this charity and help more people as they progress,” said Mr Enright. Old Elizabethan George ‘the Poet’ Mpanga was among the commentators turned to by the BBC for an insider’s perspective following the announcement of the royal engagement. 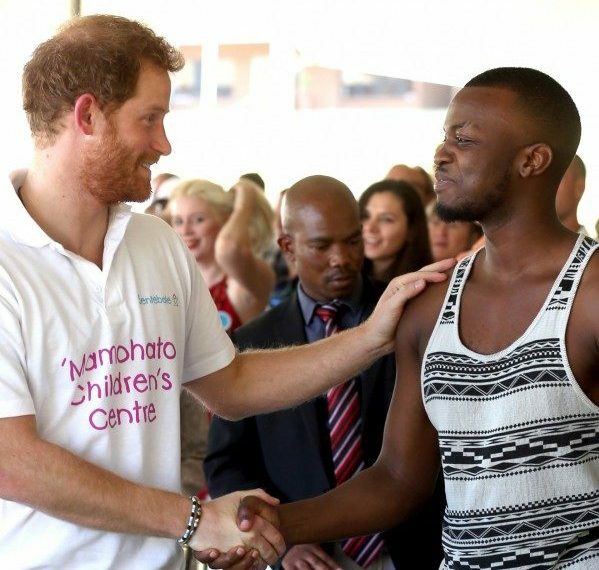 George is an ambassador for Sentebale, one of Prince Harry’s charitable foundations, which supports the mental health and wellbeing of children and young people affected by HIV in Lesotho and Botswana. Having observed the prince’s work there at first hand, he was interviewed for a primetime BBC1 documentary about the engagement, fronted by Kirsty Young. “I have seen the kids react when Harry is around – they really take to him. 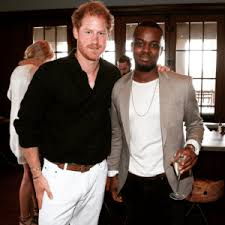 Harry seems to have a way with the kids, man!” said George, who stated that the importance of the charity lies in the fact that there is still a stigma surrounding HIV. George (OE 2002–2009) has a growing national profile as a poet commenting on major issues of the day. Earlier this year, he released a video showing himself reading a poem on hate crime. The video was produced in collaboration with the Equality and Human Rights Commission to coincide with the anniversary of the murder of MP Jo Cox. 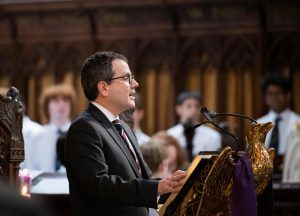 He also performed in front of the Queen and Prime Minister Theresa May at the Service of Celebration for Commonwealth Day in Westminster Abbey. George was a well-received guest speaker at QE’s Year 12 formal Luncheon, as well as leading a poetry workshop for the whole of Year 9. The School’s Christmas food and clothing collection has brought in a bumper amount, capping a successful year of support for local and international charities. Every December, QE gathers food and clothing for the Chipping Barnet Food Bank and for Homeless Action in Barnet respectively. 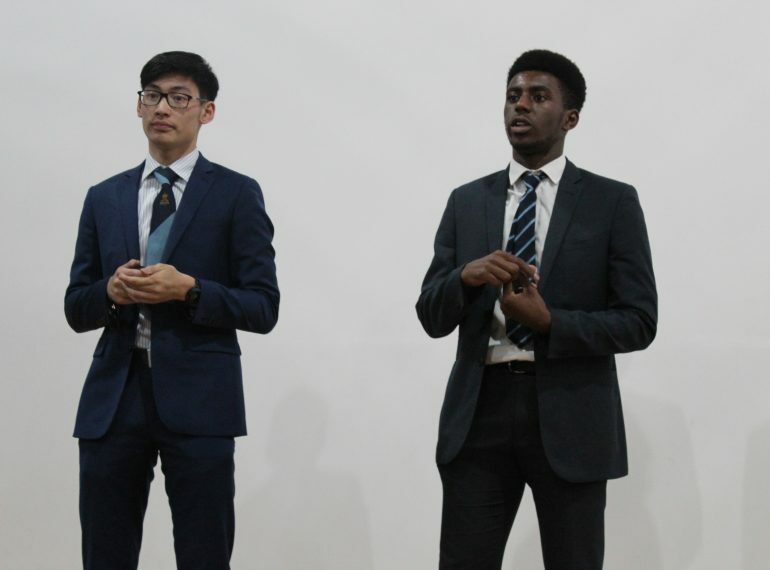 In 2017, this was overseen by Vice-Captains Abbas Adejonwo and Adam Chong, of Year 13, in the final weeks of their term of office, and by Physics teacher Georgina Garfield. The December collections are only one part of QE’s wider charity activities. 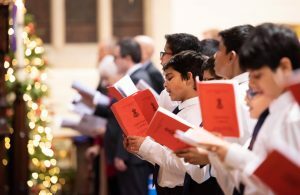 These include fundraising for the long-established Sai School Appeal in support of a village school in south-west India – which made some £3,000 this year – as well as the House charity events, which together have raised about £350 for the QE charity of the year, Orbis. Pupils had a key role in establishing the food bank collection, which has been running for a number of years. Boys continue to play an important part in promoting and organising it. The collection fulfils a dual function, supporting those in need through providing them with essential items, while also raising awareness of their plight. This year, Abbas and Adam delivered a poster campaign and used form ‘reps’ and assemblies to help spread the message. Considerably more was donated to the two December collections this year than last, with clothing making up the bulk of the donations. 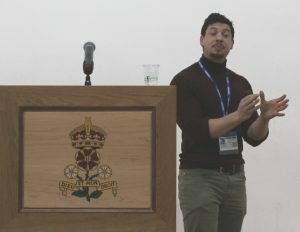 The House events in support of Orbis included a Guess the number of sweets in the jar competition and events based around being blind or partially-sighted such as Blind penalty kicks and Blind Pictionary. QE’s support for the Sri Sathya Sai English Medium School in Kerala dates back to 2002. Its main target is to secure sufficient sponsorship to support the equivalent of a Queen Elizabeth’s form of 30 pupils throughout their full-time education in Kerala. 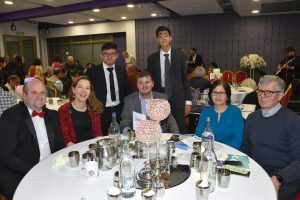 QE pupil Senthuran Jeevan’s fund-raising team have been named the overall winners in an international children’s charity’s annual awards. 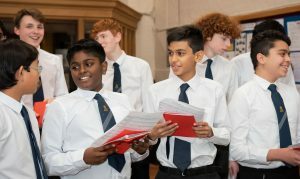 Team Oak, compr ising Year 9 pupil Senthuran and three teammates from other schools, raised a total of £7,106.12 for The Wings of Hope between October 2016 and March 2017 through a series of activities ranging from car boot sales to a special concert. Having successfully progressed through the semi-finals of The Wings of Hope Achievement Award (WOHAA) at the Houses of Parliament, the team were kept in suspense in the finals at the Royal College of Surgeons until the very end of the evening: since category prizes were announced first and category winners could not also be the overall winner, Senthuran feared they might have won nothing. WOHAA is a social enterprise programme for pupils in Years 9-13, requiring participants to work in teams of not more than six. It is designed to develop skills such as leadership and project management, while also raising money for the charity. The Wings of Hope’s work includes the support of children in India and in Malawi. In India, it provides a free education to children whose families could not otherwise afford to send them to school, as wel l as arranging tuition evenings in North Chennai for some children living in slums. In Malawi, its work involves not only education but also providing poor and orphaned children with the basics of life – food and clothing – and with the stationery they need to attend classes. The four teammates’ fund-raising activities included selling food and flowers at temples, Halloween sales, cake sales and door-to-door collecting to raise money for the North London-based charity. 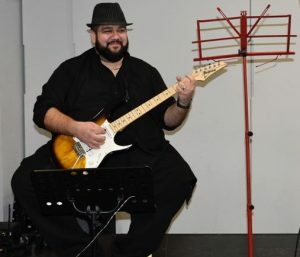 During the spring, Team Oak was behind a concert at Rickmansworth’s Watersmeet Theatre, for which they spent several months raising sponsorship and selling programme advertisements. 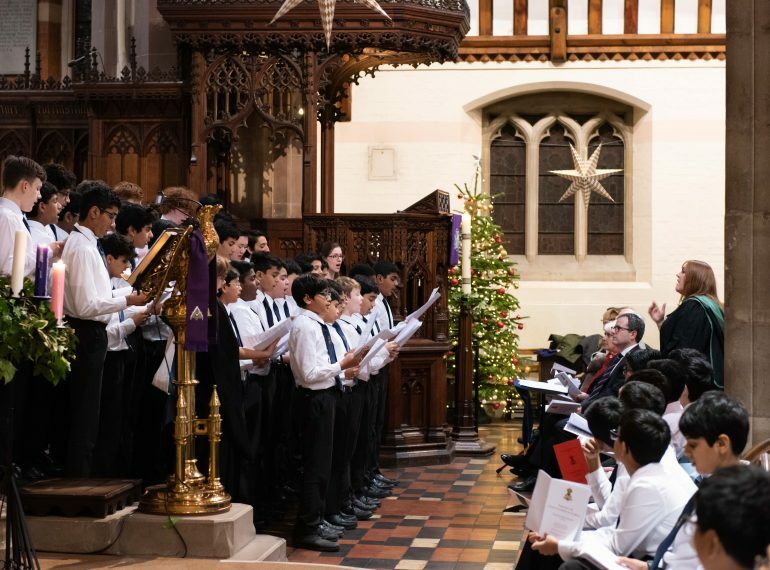 QE Headmaster Neil Enright was invited as Chief Guest at the concert in recognition of the fact that QE boys have now been involved in fundraising for The Wings of Hope for several years. As part of their prize, Team Oak will be going to India on an expenses-paid trip to teach primary-age children at the Chennai school which The Wings of Hope supports. Congratulating the four teammates, The Wings of Hope’s founder, Mrs Rajni Sriram, praised “this amazing team”.